Amy is credited with revitalizing the Chicken Soup for the Soul brand, which has been a publishing industry phenomenon since the first book came out in 1993. By compiling inspirational and aspirational true stories curated from ordinary people who have extraordinary experiences, Amy has kept the 25-year-old Chicken Soup for the Soul brand fresh and relevant. When Amy and her husband Bill, the CEO of Chicken Soup for the Soul, are not working, they are visiting their four grown children and their first grandchild. Listen to her free daily podcast, The Chicken Soup for the Soul Podcast, at cms.megaphone.com, or find it on iTunes, the Podcasts app on iPhone, or on your favorite podcast app on other devices. Amy with Brooke Burke-Charvet, her coauthor on Chicken Soup for the Soul: The Joy of Less. April 2016. Amy with country star Jo Dee Messina, and the book they co-authored. 2015. Amy with Leeza Gibbons (whose story appears in the book Amy is holding), at the Big Book Club Getaway. February 2013. Amy with Richard Simmons with their book Chicken Soup for the Soul: Shaping the New You. November 2010. Amy with Brad Melzter at the Big Book Club Getaway. February 2013. Amy Newmark was joined by Dr. Mike Dow, her co-author on Chicken Soup for the Soul: Think, Act & Be Happy, on The Doctors, 2018. Start your days with inspiration and motivation from the best of Chicken Soup for the Soul and editor-in-chief Amy Newmark. There’s nothing like learning from the personal, revealing stories of other people. Amy shares her favorite stories and the wisdom, advice, and easy-to-implement tips that thousands of people have shared in over 25 years of Chicken Soup for the Soul! A fast-paced and funny deep dive into simple ways to create a happy, confident, and positive life. 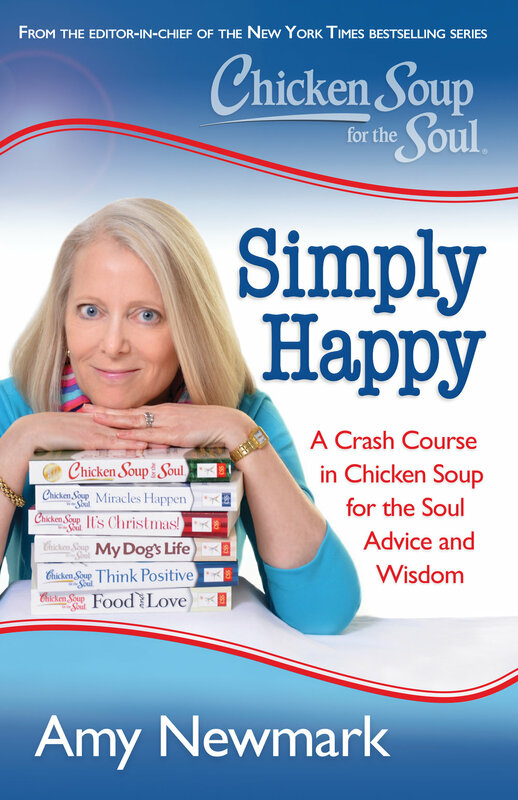 Amy Newmark distills advice and wisdom from her life and more than 20,000 Chicken Soup for the Soul stories into this crash course in how to be happy. You'll be entertained, energized, and enlightened by dozen of practical, simple tips that work instantly to improve your everyday life and your future. Click for more info, including where to buy! The power of gratitude can change your life! In this collection of 101 true, inspiring stories, people just like you share how they turned their lives around for the better by seeing the silver linings, counting their blessings, and changing their perspective. Scientific research has proven that being thankful improves your health, your cognitive function and your relationships. You can learn to be a thankful person by actively practicing gratitude, by saying thanks, and by stopping and thinking about your blessings... even on a bad day. This book will inspire you to become a thankful person! There is a healthy conversation going on now about body image and self-esteem, and Chicken Soup for the Soul is part of it. This collection of 101 stories celebrates all the different body types that women have and how we can all be curvy and confident — fit and fabulous within the body types we were issued at birth. Supermodel EMME, the world's first curvy supermodel, an advocate for women, and a spokesperson for all the curvy and confident women out there, shares her own story and introduces us to women who have learned to be fit, happy and confident about their bodies. Reading these stories will leave you feeling empowered, beautiful, and loving yourself just the way you are. Click for more info, including where to pre-order! Amy and America’s News HQ host Elizabeth Prann. On May 13, Amy Newmark was a guest on Fox News’ Saturday afternoon show, America’s News HQ, to discuss Chicken Soup for the Soul: Military Families. Click the image above to watch her interview. Click the image above to watch Amy's Tuesday, May 2 interview on Good Morning San Diego for the book Chicken Soup for the Soul: Military Families. Amy on Hallmark Channel's Home & Family, talking about "the power of no." For a full listing of Amy Newmark's most recent press, click here.